Two Super Bowl appearances in the last eight years, a sure-fire Hall-of-Famer at quarterback and a team that looks to make the playoffs for the ninth time in 11 years, but those accomplishments notwithstanding, I am terrified for Packer fans. Because if any giant, mutant rats are discovered that are proportionately configured to the size of cheese wedges Packer fans wear on their heads, unless cheese has more powers than we know of, civilization in Green Bay, Wis., is suddenly just a side item on the all-you-can-eat Helpless & Screaming Human Buffet. But tell that to Packer fans, who, every Sunday, continue to wear dairy products on their heads that only serve as temptation for giant rats. Packer fans, unless you have a viable tangent up your sleeves--such as giant mousetraps hidden underneath your parkas--you are asking for it! ‘Sconsin, famous for cheese, has long been known as the Constipation State. Foamation inc., located on the Internet at www.cheesehead.com, has been the state’s supplier of Cheesehead products since 1987, helping to cork up America, one wedge at a time! Chief competitors with Pruneheads, Foamation inc. has Cheesehead products for every person imaginable: large Cheesehead hats, for those who are most in need of a laxative; medium-sized Cheesehead hats for teens; and small Cheesehead hats for infants. There are also Cheesehead fire-fighter hats, cowboy hats, baseball hats, fez hats, sombreros and crowns. For those who want nothing on their heads, there are Cheesehead sweatshirts, neckties and bowties. And for those who want to play with their cheese, there are Cheesehead footballs, Frisbees, coasters, cozies, bricks, toilet seats (like anyone would actually need one), antenna wedges, soaps, earrings, magnets and fragrances. About the only item missing is a neon, “OPEN 24/7” sign that will alert the giant rats to potential dining opportunities. But could it be that giant rats are already among us and are only waiting for the proper time to strike? Are giant rats even in charge of Foamation, inc. and, dare I say, Hickory Farms? 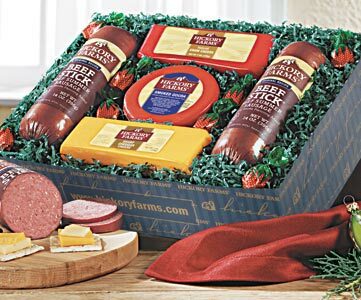 Compressed meats, condiments and cheeses galore, Hickory Farms is like Green Bay indoors. It is the perfect destination to buy gifts for those on your list who you don’t know what to get, as well as the ideal place to treat yourself--who needs something to keep their stomach from making disturbing, bear-like noises throughout the afternoon--with a free sample. There is nothing like sitting around the Christmas tree on Dec. 25 with your family (unless, of course, you’re related to Mark Chmura), watching everyone properly demonstrate the Blitzkrieg Method of opening presents and gazing, amidst flying tissue paper and bows, as someone opens a large box of prepackaged summer sausage, block of gouda, with a spicy chipotle dipping sauce. The only experience more satisfying is when you are opening said gift yourself. For those Packer fans who can’t make the game (Packer games are sold out until the Apocalypse), sitting in a recliner, watching Favre throw four touchdown passes, wearing a Foamation inc. piece of cheese on your head and gnawing on a wheel o’ cheddar makes for an alluring afternoon, wouldn’t you agree? It’s always the little things that give you the most pleasure. All the giant rats have to say is enjoy it while it lasts.